Why destroy an innocent man? 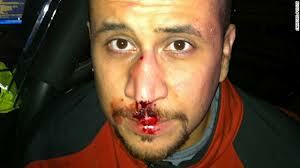 George Zimmerman’s nose after getting a beating from Trayvon Martin. I am a native Jersey boy and a New York Giants fan. I used to really like Victor Cruz. Not any more. Justice was done in the Trayvon Martin trial. An innocent man is now free. What is disgusting to me is that the left in this country (which includes many in the media like Sharpton, Matthews, etc.) was willing to sacrifice the life of a man for a political agenda. They do not care about people. People are tools, mere pawns in their political world, to be used and even destroyed if necessary. It’s ugly, immoral and evil. It’s a shame that Trayvon’s parents, family and friends are deprived of their loved one, a real tragedy. But George Zimmerman was no racist. He did not wake up that fateful day and say to himself, “I am white, I don’t like blacks and if I see one today I am gonna teach them a lesson.” But that’s what people on the left were trying to convince the public about George Zimmerman. For them it’s all about keeping black people on the left-wing, Democrat plantation. It’s a successful tactic that will have many black folks seeing themselves as victims of racism in perpetuity – those who allow themselves to be manipulated by this sinister strategy will remain faithful pawns in the left’s bid to seize and maintain control of all political power in this country.